About 10 years ago, I worked for nearly a year in San Jose, traveling home every other weekend to see my family in St. Louis. We chose not to move because my daughter was a junior in high school, and we didn’t want to separate her from her class. In San Jose, I lived for six months in a studio apartment – new and fully furnished, but pricey at $1,550 a month for 287 square feet. I had a friend in a similar situation; his family stayed behind in Baltimore while he came to work for the same company I had joined. As my six-month lease was about to expire, he encouraged me to come live in the same house he was in. The owner needed renters to help pay the mortgage, and I would have my own room in a beautiful, two-story home for $750 a month. And so it came to be that Rong Fong Shen, Yong Ning Zhai and Pete became roommates. Rong Fong was from Taiwan, and Yong Ning – the owner of the house – came from mainland China. They occasionally spoke Mandarin, but normally they spoke English to make sure I wasn’t excluded from their conversations. I once commented that Mandarin seemed to be extremely difficult, but Rong Fong believed that compared with English, Mandarin was simple. If I ever wanted to live in Taiwan, he said, I could easily make a six-figure income just teaching children the ins-and-outs of English. And I wouldn’t have to know a word of Taiwanese (Hokkien), Mandarin or any other Asian language. He saw the puzzled look on my face. We fix a broken gate. When we’re about to leave for a trip, we’re fixing to go. We give concrete time to fix. If we like a certain ice cream, we can’t wait to get our weekly fix. When we don’t want an animal to reproduce, we have it fixed. If a sporting contest is rigged, the fix is in. If we need to concentrate on some object in the distance, we fix our eyes on it. When something goes wrong, we want to fix the blame. When we decide what to charge for something, we fix the price. When we process a photograph (using film), we wait until the image is fixed before we remove the photographic paper from developing solution. When we want revenge, we pledge to see that our enemy is fixed. When we’re in a difficult situation, we talk about the fix we’ve gotten ourselves into. If we arrange a blind date, we fix the boy up with the girl. If we don’t understand something completely, we try to get a fix on it. Just about the time Rong Fong got a fix on all the different meanings of “fix,” he faced another problem. So here’s something to think about. Most of us in the U.S. have never gotten serious about learning another language. 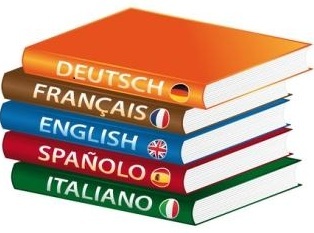 Foreign languages seem hard to us, but the reality is that, when compared with a non-native speaker learning English, we should have an easier time learning another language. Many of our words have been derived from Latin, Greek and the Germanic languages, so other languages’ vocabulary is often accessible to us. If you’re looking for something to engage and enrich your mind, tackle another language. In doing so, you’ll learn more about your own language, and you’ll probably learn more about another culture. While you’re giving it serious consideration, I’m going to decide whether to dust off my old German books or invest in Rosetta Stone Spanish lessons. This entry was posted in Communications, Humor, Society and tagged English, fix, foreign language, language, Mandarin, Taiwanese. Bookmark the permalink. Cognates are a blessing when learning the vocabulary of another language. English borrows from so many different languages we don’t realize how few words are actually our own. Invest in the Rosetta Stone Spanish – or download the free Podcasts on iTunes – or buy the Spanish language games. I used Rosetta Stone for Indonesian and found it marvelously fast.